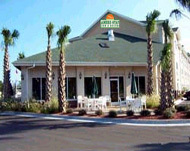 Ameristay Inn is a hotel imbibed with luxury and comfort. It is a hotel of convenience that comes at a reasonable rate. Guests are provided with a complementary breakfast. The hotel has a very convenient location. It is situated in the traditional downtown area of the city. The rooms are airy, spacious and flooded with light. A magnificent swimming pool is a main attraction of this hotel. Guests can choose from either standard guest rooms or Jacuzzi suites. Banquet facilities are also available. This hotel is perfect for both business conferences and family functions.